A cropped version of my painting was used to promote an event on their company fb page. and was sent out to over 14,000 fb users. My first communication was via fb messaging after I asked "Can you share why you are using a copyright image of my painting on your wall? It is the screaming face, and I never gave permission for it's use, nor was I asked, nor have I received payment or any credit for my work." I don't know which admin I messaged with on the Fusse Studio private messaging, R who is general manager at Fusse Studio's or A but whoever it was was very understanding, apologetic, polite and responsive. They did ask if there was something within reason they could do to ease this and help us come to a resolution. I asked to be payed. Can't say the company email had quite the same tone.I was accused possibly running some kind of scheme to make bucks. They said the person who used it found it on a search from google and they felt it would suit their needs for a fb profile events page pic and I am owed for what exactly? 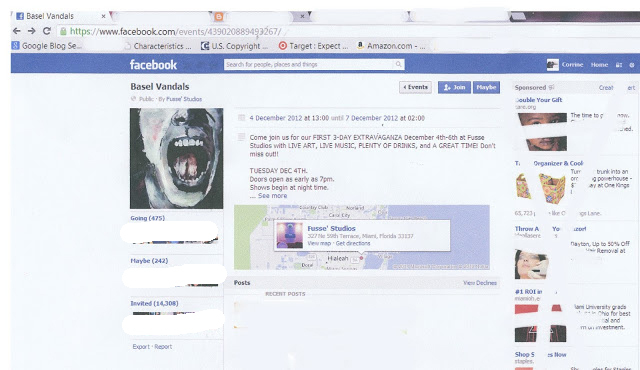 Thank you for removing my photograph of my painting used on your business events page on fb. While it is nice to know people enjoy my work, unfortunately because I was not given any credit, and the file name altered I lost an important professional opportunity as an artist. The other problem also is I have no idea how many people will have downloaded my image from your site and what purpose they would use it for. I am not asking the bloody moon here. I have had no response. Of course it all could be some strange misunderstanding? ahem! $50 licencing fee is actually quite reasonable, as would be an inclusion of a line saying "This image is copyrighted to..... do not download without contacting said artist at...."
You're not acting outrageously here. Of course, after their response to your payment request, you could ask if they're prefer to discuss this with your lawyer/in a Courtroom and if so, where can you contact their legal department? (name phone email and snailmail address). Then get in touch with your nearest Law University and ask the professors there if they know anyone you can speak to who preferably does pro bono!